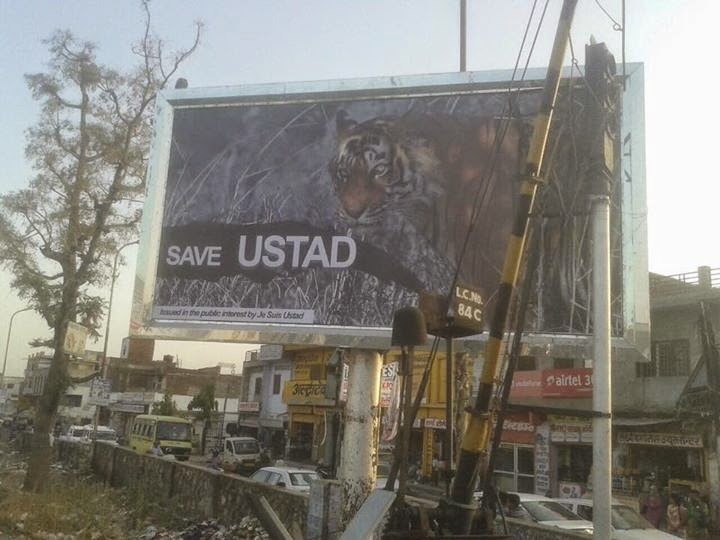 Today wrote an article on the ongoing campaign 'HelpT24, Save Ustad' for HT, Agra. (Check the link for more information and help the terrorized tiger! A 9 year old Tiger, whose address use to be the wilds of Ranthambore Tiger Reserve, currently living on the hot sand bed of Udaipur Zoo. The Tiger's (T24 - Ustad) territory was of more than 40 Sq Kms. In past since 2010 this tiger has killed 3 people. Unfortunately every time it was human interference and had killed for defense. 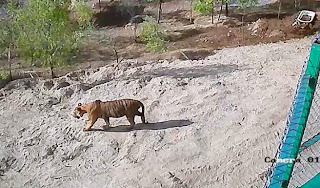 on 8th May 2015 one of the guard who was posted on the entry gate went in the forest and was attacked by Tiger. No one was near by, and after an hrs when his body was found then forest guards went in to inquire. There they found Ustad sniffing. So just to make the things easy they passed the blame on him that he has attacked and killed the guard Gheesu. Experts says this was done by his son T-72 (Sultan) coz at the time of attack ustad was sighted bit far. Animal lovers are also not convinced with the story. 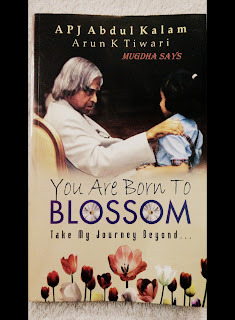 A campaign was initiated across India, and a page is also created on Facebook with the name ‘HelpT24’. 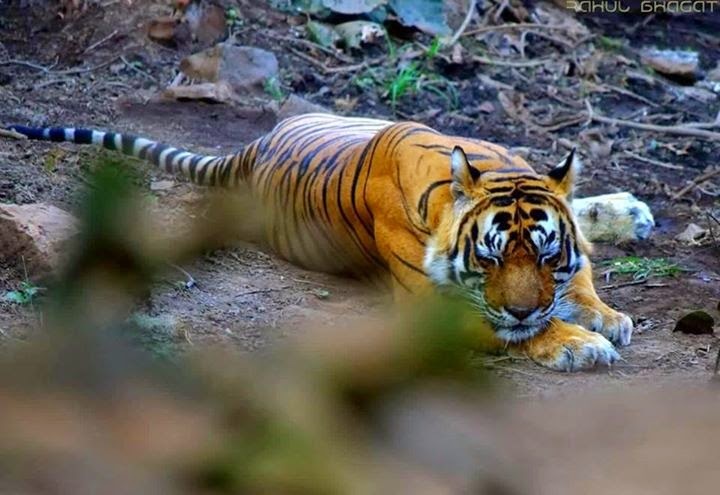 According to the experts, a tiger could only consider as man-eater when he killed the person and eat the corpse but in this case, officials recovered intact dead body of the forest officers. 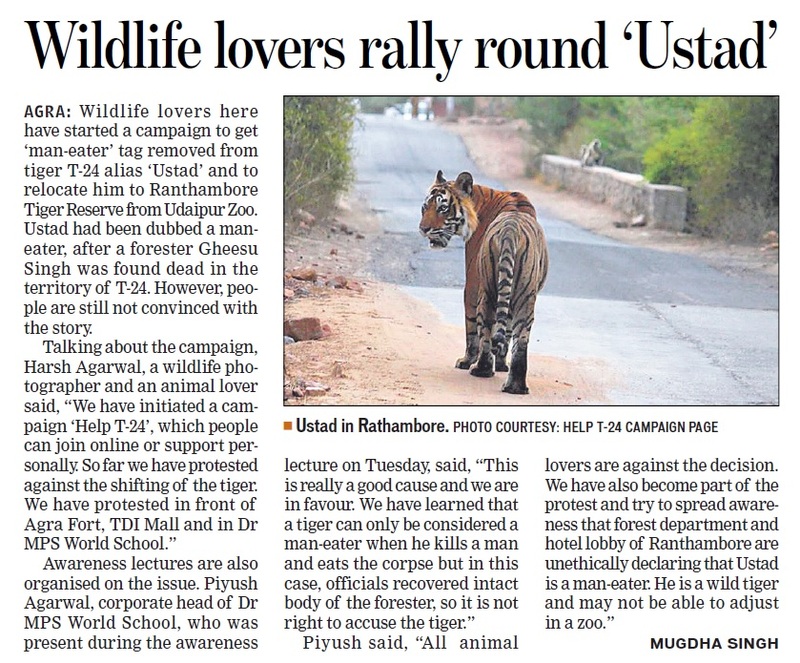 In hush to clear the case, officials declared Ustad as Man eater ignoring all the set procedure and guidelines and decides to shift him in Udaipur zoo. 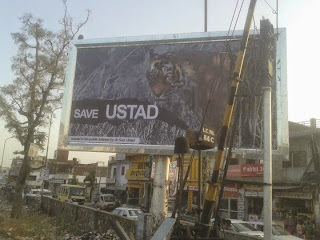 After all the protests forest minister and other high officials gave the statement that without proper investigation tiger won't be relocated. 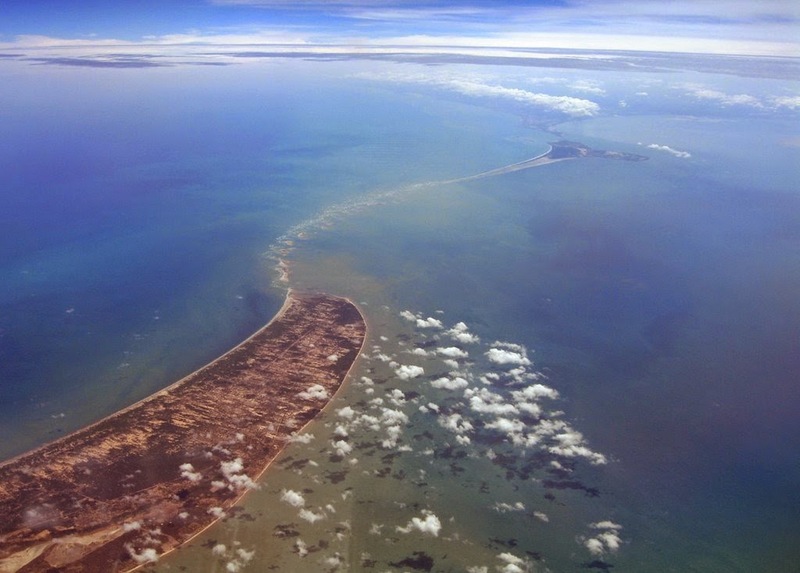 The territory that use to be 40 Sq km for Ustad now confined to 40 mts. As reported, few months ago in the same cage one tiger died because of infection. 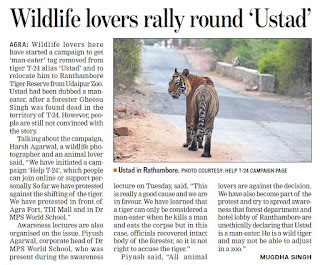 To remove the ‘man-eater’ tag from T-24 tiger ‘Ustad’ and to bring him back at Ranthambore Tiger Reserve from the Udaipur Zoo, wildlife lovers initiated a campaign, where they travel place to place and aware people about the issue, organizing Candle march and protesting in front of Agra Fort. Animal lovers are against the decision. He is a wild tiger and may not be able to adjust in zoo. 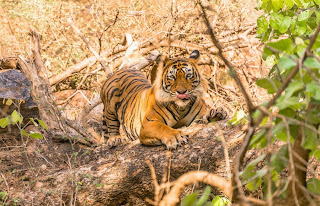 Tiger is also a father of the cub and if forest department shift him then what will happen with the cub, as we all know in wild, tigers try to kill other tiger’s cubs to become the Alpha Male! How do I say, I admire your effort, but I disagree. We do not know what is in tiger's mind. It may be too risky to wait for another man to lose his life. All Tigers will be endangered and threatened.